Last Year Informatica introduced the latest and most advanced in product information management application: Informatica MDM – Product 360 version 8. 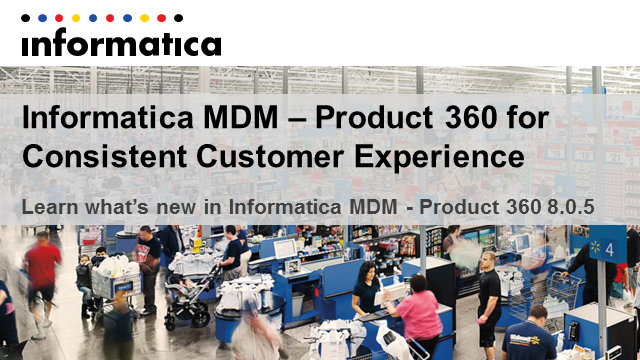 Informatica continues to innovate and brings you MDM – Product 360 8.0.5. Supporting business users in their mission critical journey of authoring and mastering product data is key in a content driven and digital world. Discover how the latest release of Informatica MDM - Product 360 enables you to be the true leader in the market. Learn how workflows automate your critical business processes such as new product introductions. Informatica's market leading data quality platform supports the process in the back and the enhanced business dashboard provides the necessary SLA's and allows each individual contributor of your enterprise to understand the data flow and focus on the right things to be successful. 3.An interface to the new Major Release 3 GDSN. based data pool from 1WorldSync.